This week the SnakesCast celebrates games by Canadian designers. Today, we look at games by Daryl Andrews, Christopher Chung, Jay Cormier and Sen-Foong Lim. 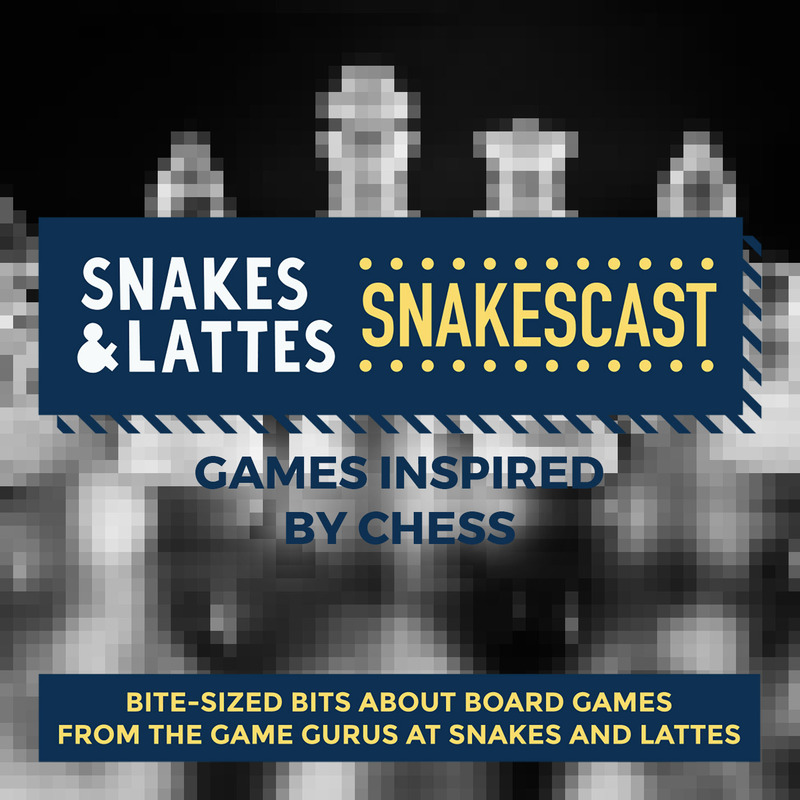 This week on the SnakesCast, we turn the focus on designers from Canada, many of whom are friends and visitors at the café. Today, Monday June 18th 2018, we discuss games by Daryl Andrews, Christopher Chung, Jay Cormier and Sen-Foong Lim. This week the SnakesCast celebrates games by Canadian designers. Today, we examine some Canadian classics both old and new. This week on the SnakesCast, we turn the focus on designers from Canada, many of whom are friends and visitors at the café. Today, Wednesday June 20th 2018, we discuss games by Scott Abbott, Chris Haney, Laura Robinson, Paul Toyne, Tom Quinn, Ted Quinn, Mark Sherry, and Conor McGoey. Trick-Taking Games, Part 1 - What is trick-taking? This week on the SnakesCast, we take a close look at trick-taking games. We begin by asking what trick-taking is, where it came from, and discussing some better-known examples. Choose your cards carefully this week on the SnakesCast, as we take a close look at trick-taking games. Today, Monday June 11th 2018, we begin by asking what trick-taking is, where it came from, giving some examples of well-known games, and looking at why we think it is not more prevalent in modern board gaming. This week on the SnakesCast, we take a close look at trick-taking games. We carry on today by looking at some excellent examples of contemporary games. Choose your cards carefully this week on the SnakesCast, as we take a close look at trick-taking games. Today, Wednesday June 13th 2018, we continue by looking at some excellent examples of contemporary trick-taking games, and start observing things that may have been inspired by them. This week on the SnakesCast, we take a close look at trick-taking games. We end this week by discussing more games, the (lack of) theme in the mechanism, and where it could go. Choose your cards carefully this week on the SnakesCast, as we take a close look at trick-taking games. Today, Friday June 15th 2018, we discuss some other games, look at the use of theme in trick-taking games, and talk about where the mechanism could go in the future. This week's SnakesCast examines gaming without speaking, whether within the game or during the process of teaching and learning it. Today, we begin by talking about games that have at least one player who cannot speak. 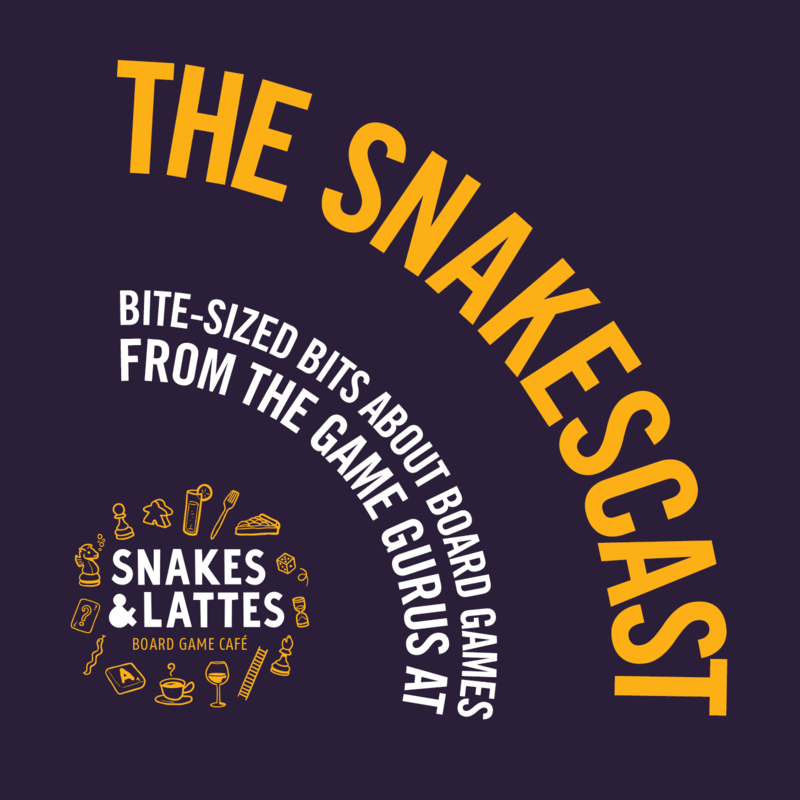 This week's SnakesCast examines gaming without speaking, whether that is a part of the game, or ways of teaching and learning a game without speech. Today, Monday June 4th 2018, we begin by talking about games in which at least one player - if not all of them - is not allowed to speak. This week's SnakesCast examines gaming without speaking, whether within the game or during the process of teaching and learning it. We continue by discussing methods of teaching games without speaking. 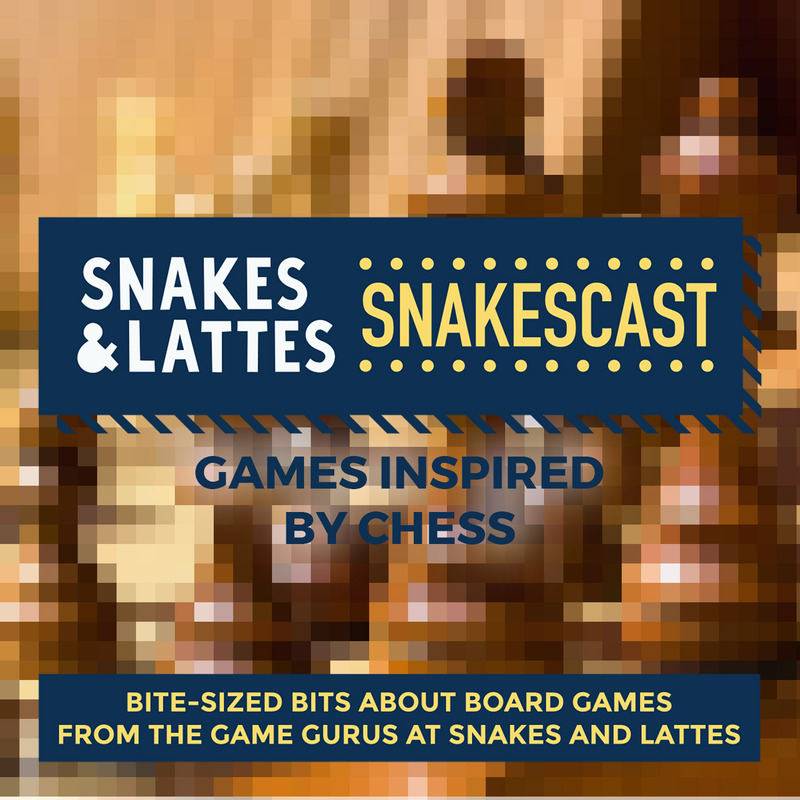 This week's SnakesCast examines gaming without speaking, whether that is a part of the game, or ways of teaching and learning a game without speech. Today, Wednesday June 6th 2018, we continue by talking about methods of teaching games without speaking, and also games that would not be too difficult to teach that way. This week's SnakesCast examines gaming without speaking, whether within the game or during the process of teaching and learning it. We finish off this week by discussing other non-verbal scenarios or those with language barriers. 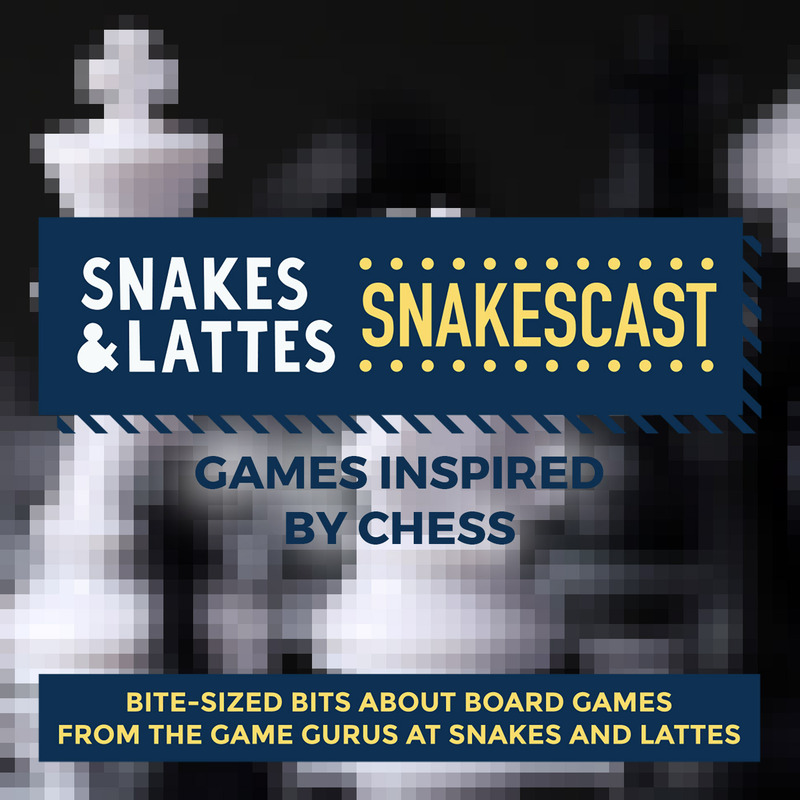 This week's SnakesCast examines gaming without speaking, whether that is a part of the game, or ways of teaching and learning a game without speech. Today, Friday June 8th 2018, we finish up the week by discussing some more games that could be good for non-verbal gaming, and looking at other non-verbal scenarios and language barriers, as well as some suggestions of how to overcome them. How Important is Theme in Games?, Part 1 - What is theme and do we like it? We are asking the question "How important is theme in gaming?" this week on the SnakesCast. We start by discussing the nature of theme and its importance to us. We look at one of the most divisive questions in gaming this week on the SnakesCast: "How important is theme?" Today, Monday May 28th 2018, we start by discussing the nature of theme, how it applies both to gaming and gamers, and its importance to us personally. How Important is Theme in Games?, Part 2 - Should theme always be applied? We are asking the question "How important is theme in gaming?" this week on the SnakesCast. Today, we discuss whether themes should be applied sometimes, and examples of how theme can emerge from some games. We look at one of the most divisive questions in gaming this week on the SnakesCast: "How important is theme?" Today, Wednesday May 30th 2018, we continue the discussion by talking about whether we think themes should be applied at times, overused themes, and discuss games where theme can emerge even if it's not the focus. How Important is Theme in Games?, Part 3 - What about games that do something different? We are asking the question "How important is theme in gaming?" this week on the SnakesCast. We finish the week by talking about games that do things differently, emergent storytelling, and using theme to teach. We look at one of the most divisive questions in gaming this week on the SnakesCast: "How important is theme?" Today, Friday June 1st 2018, we finish up the week by discussing a few games that have some theme that is not central to the game, talking about emergent storytelling in games, and examine using theme to help learn and teach games. Bookmarks at the ready – we look at games based on literature this week on the SnakesCast. We start by looking at games that are directly based on works of fiction. Get your bookmarks ready - this week the SnakesCast is looking at games that are based on literature. Today, Monday May 21st 2018, we are going to begin the conversation by looking at games based upon works of fiction, talking about both light and heavier games. Correction - the series from Iello is called Tales & Games. 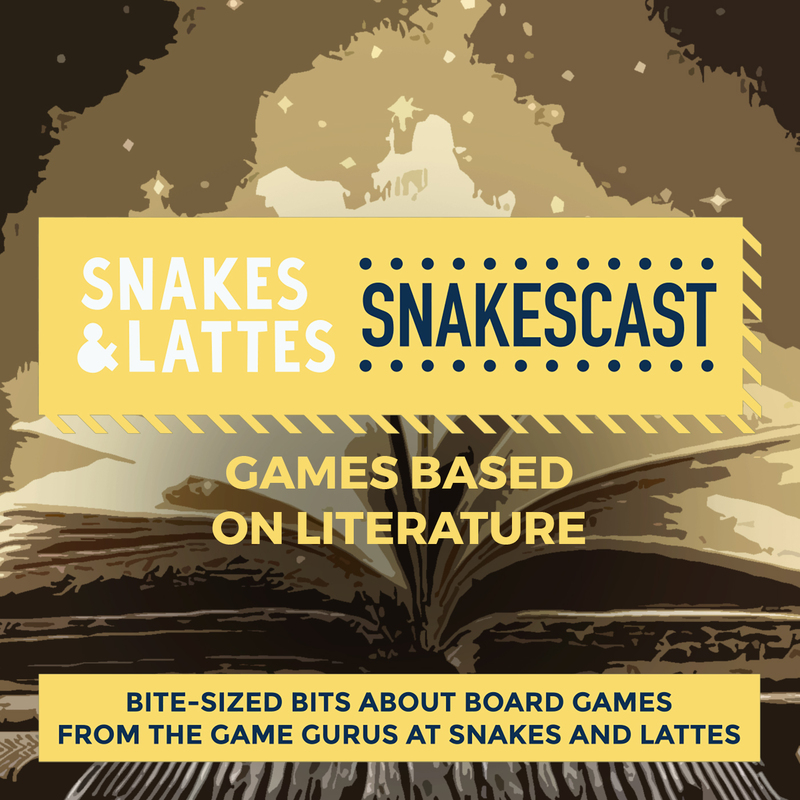 Bookmarks at the ready – we look at games based on literature this week on the SnakesCast. Today we check out some other fiction-inspired games, and also a couple of games that were literally fictional first. Get your bookmarks ready - this week the SnakesCast is looking at games that are based on literature. Today, Wednesday May 23rd 2018, we continue by checking out some other games that are based in famous works of fiction, and also discuss a couple of games that existed in fiction before they became actual games. Bookmarks at the ready – we look at games based on literature this week on the SnakesCast. We finish by talking about games where you build your own story, and then delving into games based in Tolkein's Middle-Earth. Get your bookmarks ready - this week the SnakesCast is looking at games that are based on literature. Today, Friday May 25th 2018, we finish first by looking at games where you build your own story, and then delving into the seemingly endless supply of games based in Tolkein's Middle-Earth. 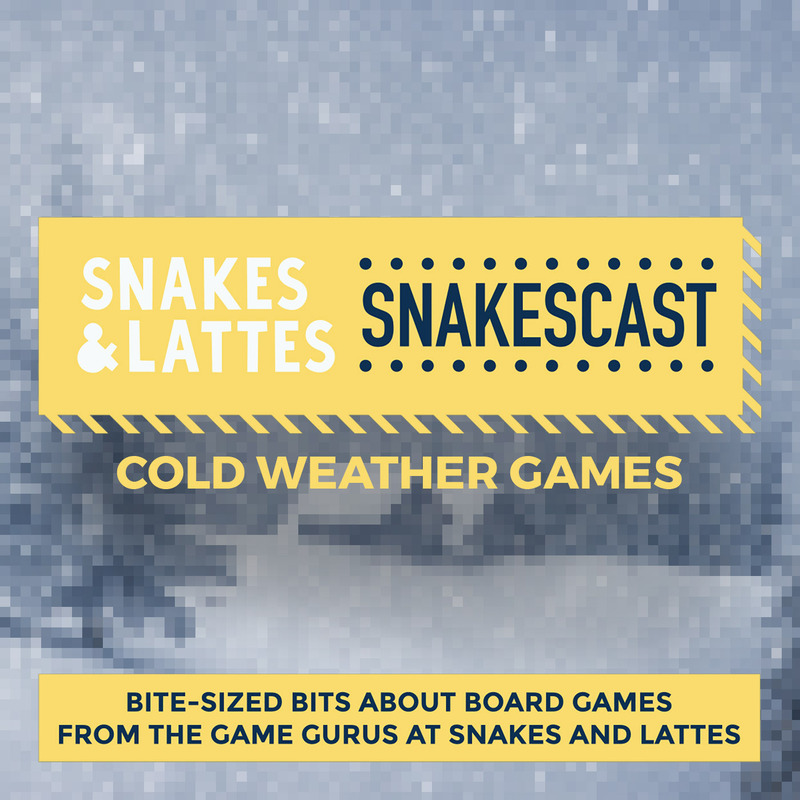 This week on the SnakesCast, we look at games you might take with you when going away for a long weekend or more - starting with smaller and more accessible games that anyone can play, and discussing things to keep in mind. 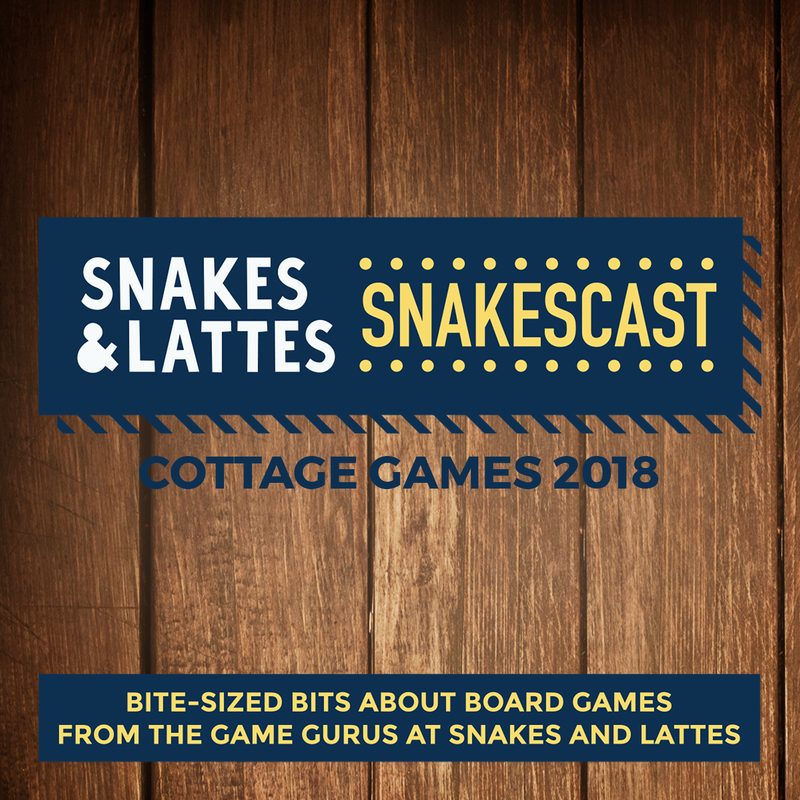 It's coming on for summer, and so this week the SnakesCast looks at games that you might want to take with you when you go away for a long weekend, a cottage retreat, or a holiday. Today, Monday May 14th 2018, we discuss the things you might want to consider when taking games somewhere (such as your audience, where you're going, and the size of the game), as well as games to take that are quick, popular and easy to start out with. This week on the SnakesCast, we look at games you might take with you when going away for a long weekend or more, and today we continue with great games for a planned game session, and talk about theming a game night. 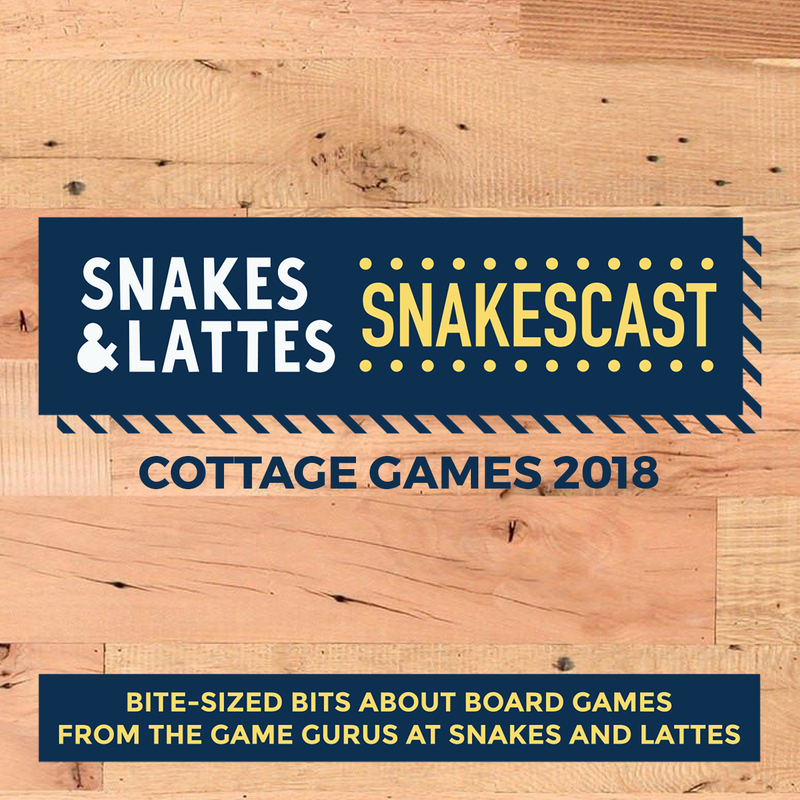 It's coming on for summer, and so this week the SnakesCast looks at games that you might want to take with you when you go away for a long weekend, a cottage retreat, or a holiday. Today, Wednesday May 16th 2018, we talk about the games that you might want to have for a planned game night with a group who are not all hobby gamers, but who want something a little more in depth that those games we discussed on Monday. We also touch on the idea of theming a game session to give your night some cohesion, and discuss loading your mobile devices with game apps. This week on the SnakesCast, we look at games you might take with you when going away for a long weekend or more. We finish this week by talking about the big games you take to set up for a day, a night or even a whole weekend. 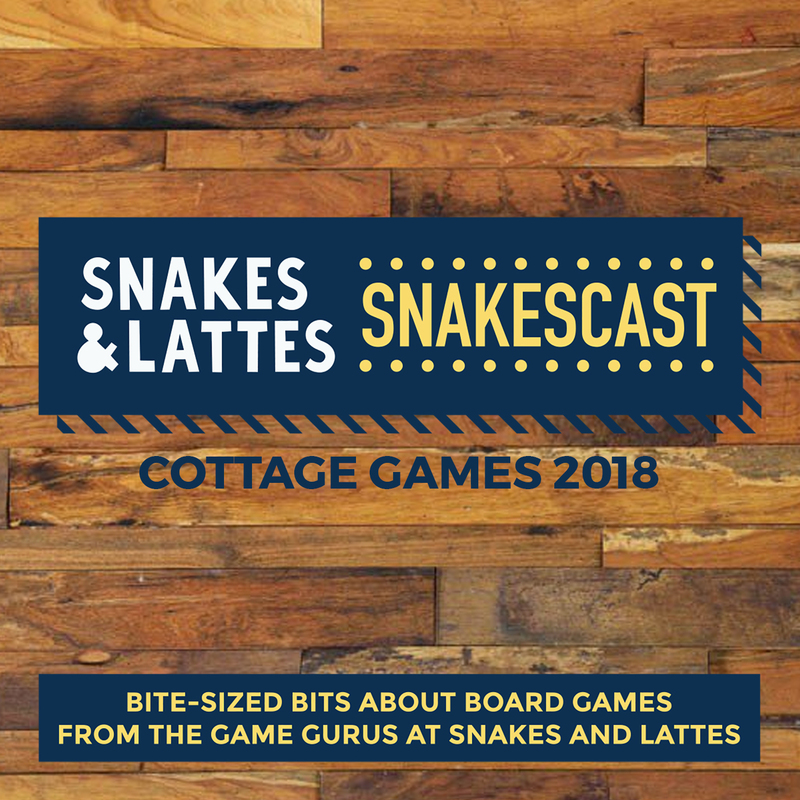 It's coming on for summer, and so this week the SnakesCast looks at games that you might want to take with you when you go away for a long weekend, a cottage retreat, or a holiday. Today, Friday May 18th 2018, we talk about the kind of game that you might want to take up when you are planning a whole weekend of heavy gaming, an all-day (or -night!) game, or the chance to crack out a big Legacy or campaign game. We offer thoughts on building your own home game library this week on the SnakesCast, starting with where you might want to start for your first purchases. 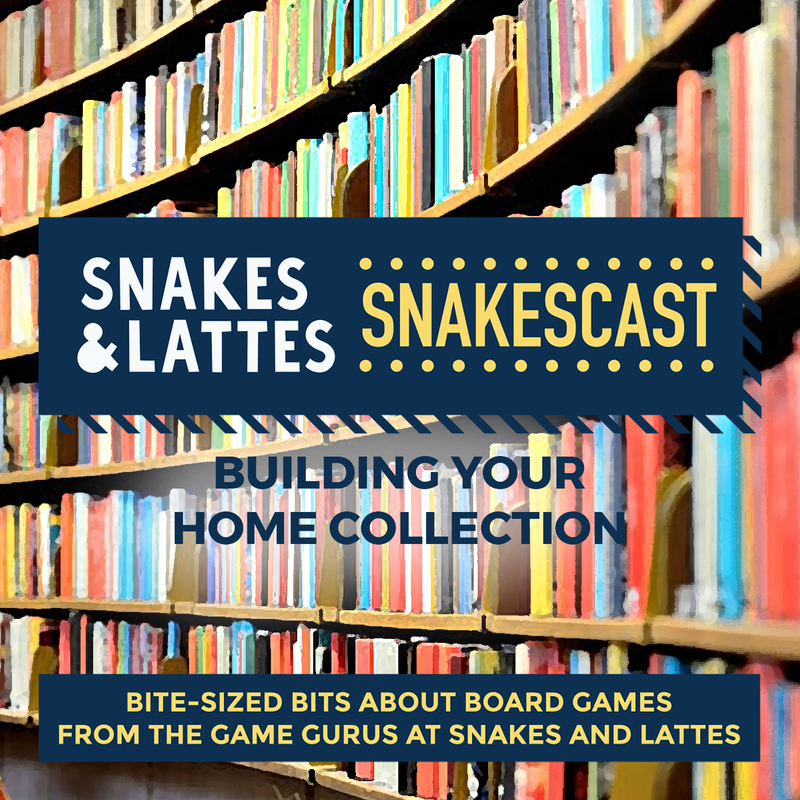 We offer our thoughts on building your own home game library this week on the SnakesCast, from the gateway and accessible games to the deep and complex ones. Today, Monday May 7th 2018, we begin by looking at the games you might consider for your first purchases - or games you might add to a collection to appeal to people who are new to the hobby. We offer thoughts on building your own home game library this week on the SnakesCast, continuing with games you would want to bring out with casual gamers who have entered the hobby already. 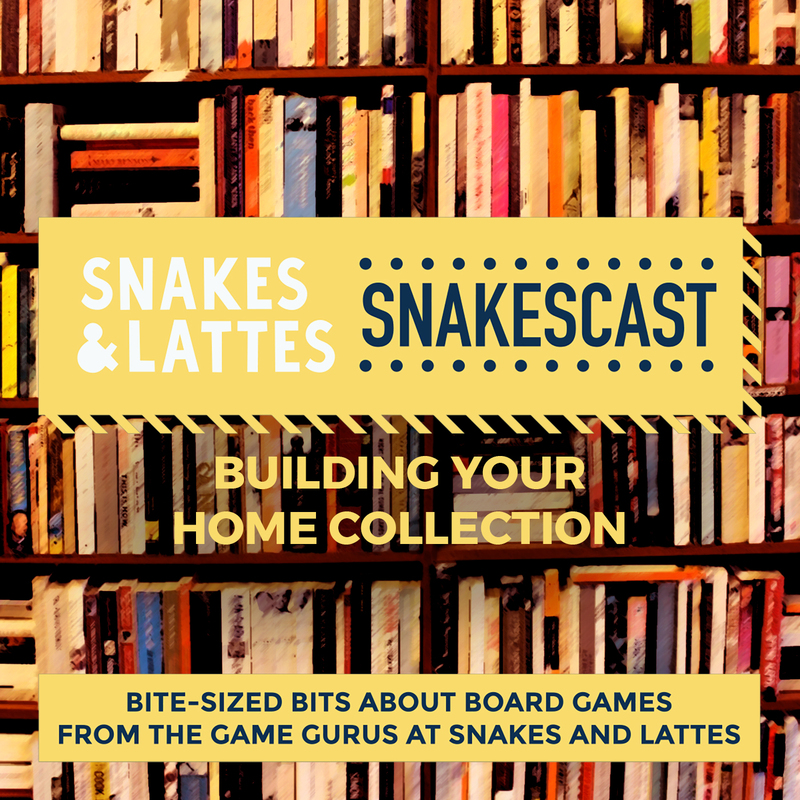 We offer our thoughts on building your own home game library this week on the SnakesCast, from the gateway and accessible games to the deep and complex ones. Today, Wednesday May 9th 2018, we discuss games you might want to have for those who are interested in slightly more advanced games, and we also touch on methods of protecting your games, and games that you might want to put on display at home. We offer thoughts on building your own home game library this week on the SnakesCast, and we finish by discussing some of the big games you might look at adding to your collection. 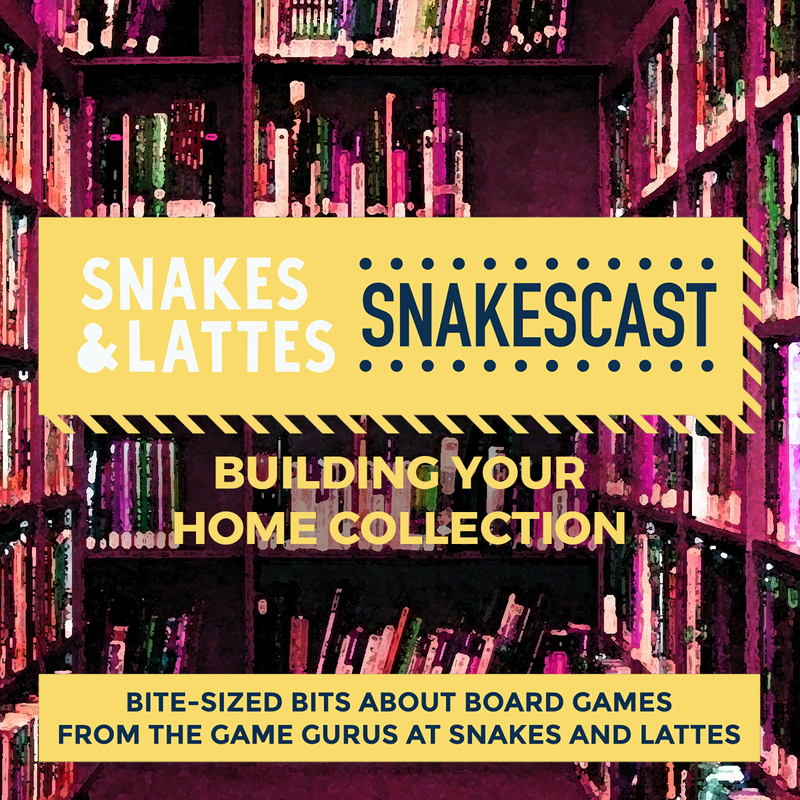 We offer our thoughts on building your own home game library this week on the SnakesCast, from the gateway and accessible games to the deep and complex ones. Today, Friday May 11th 2018, we finish by talking about some heavy games we want in our collection, some solitaire games to start out playing solo, and ways you might want to enhance your games with additional components. 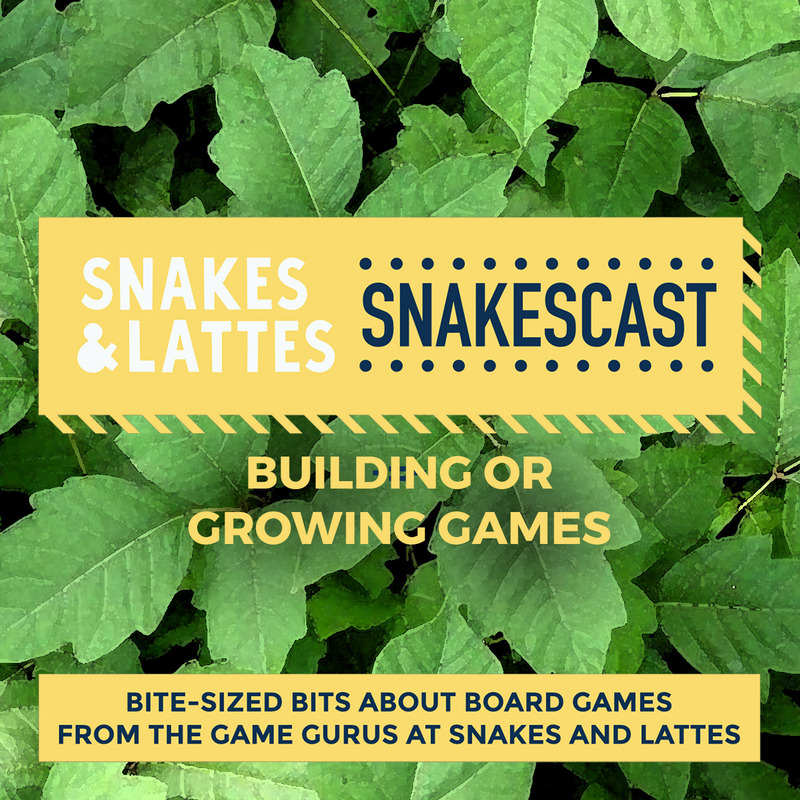 The SnakesCast this week is examining games about growing or building things. Today, we begin by looking at some easy and quick games that involve one of these two activities. Whether by planting a seed or laying a foundation, the focus for the SnakesCast this week is growing things or building them. Today, Monday April 23rd 2018, we begin by looking at some easy and quick games that involve one or other of these activities. 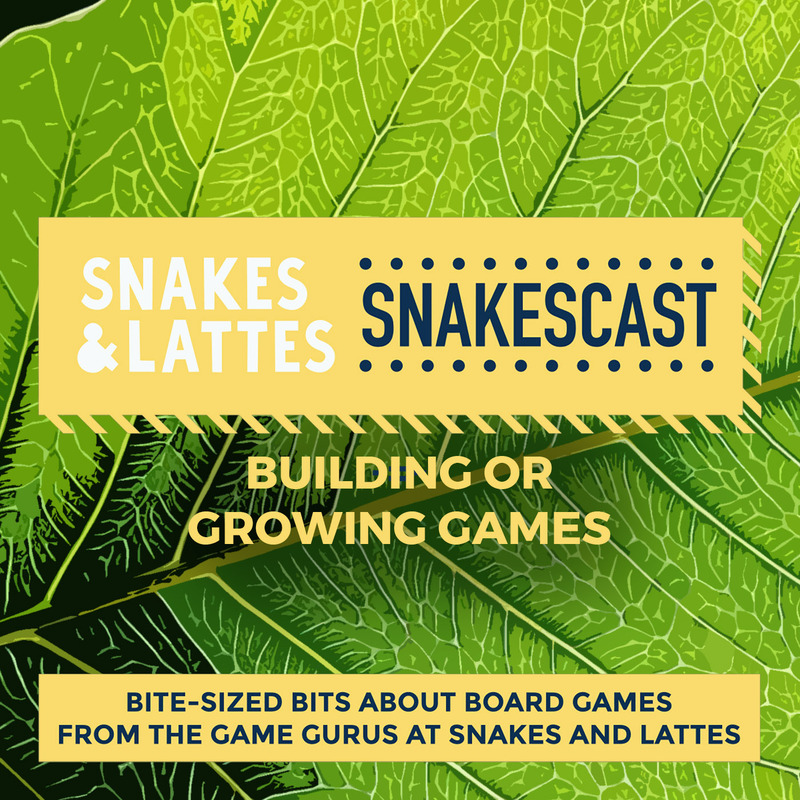 The SnakesCast this week is examining games about growing or building things. Today, we talk about some slightly more complicated games, and start to notice a pattern in the ones that stand out. Whether by planting a seed or laying a foundation, the focus for the SnakesCast this week is growing things or building them. Today, Wednesday April 25th 2018, we continue the discussion with some more game examples, and also begin to notice a pattern in the games that stand out to us. 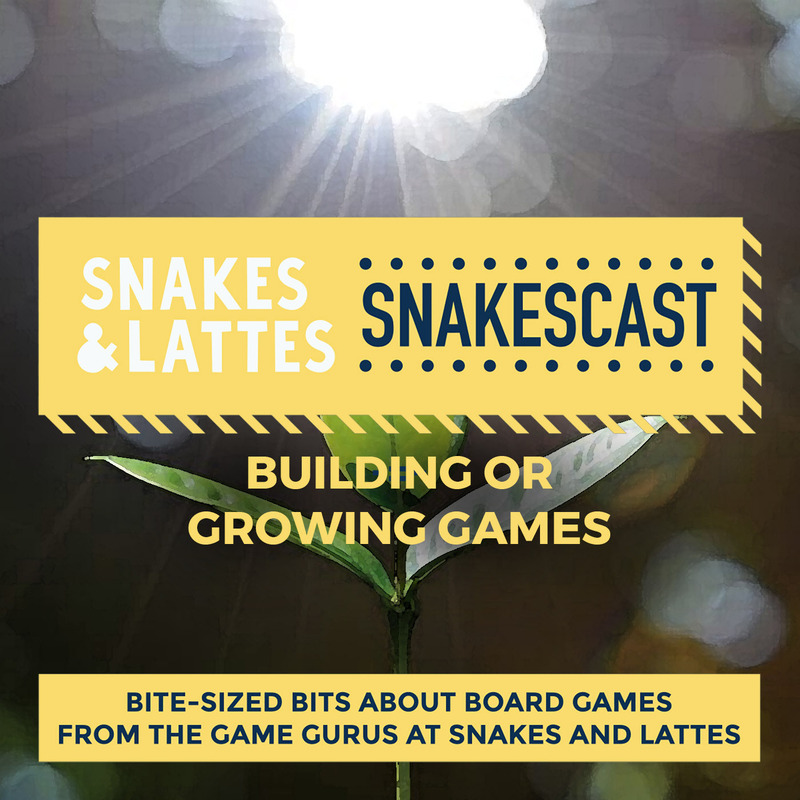 The SnakesCast this week is examining games about growing or building things. We end with some of our favourite games in this theme, some of which are quite extraordinary. Whether by planting a seed or laying a foundation, the focus for the SnakesCast this week is growing things or building them. Today, Friday April 27th 2018, we finish by discussing some of our favourite games with this theme, which include some amazing game components as well. Superhero Games, Part 1 - Where are all the superhero games? Whether by signal in the sky or supernatural intuition, we are called to discuss superhero games this week! Join us as we begin talking about a genre that seems underrepresented in board gaming. Whether by signal in the sky or supernatural intuition, here at the SnakesCast, we are called to discuss superhero games this week! Today, Monday April 16th 2018, we begin by looking at the genre of superhero games and discuss how it appears to be underrepresented for its current popularity. Superhero Games, Part 2 - It is a bird? Is it a plane? Whether by signal in the sky or supernatural intuition, we are called to discuss superhero games this week! Today, we start to look at some original board games with a superhero theme. Whether by signal in the sky or supernatural intuition, here at the SnakesCast, we are called to discuss superhero games this week! Today, Wednesday April 18th 2018, we examine some original board games with the theme of superheroes, and touch on the fact that very few make it to the popular rankings (at least in terms of those on Board Game Geek). Organisational Games, Part 1 - What is an organisational game? This week, we look at games that feature organisation as part of their theme or mechanisms. Today, we begin by defining what we mean by organisational, and discussing some examples. We're getting organised here at the SnakesCast, as we discuss games that feature organisation either as part of their theme or mechanisms. Today, Monday April 9th 2018, we begin by defining organisational games for the purpose of the week's podcasts, and giving some entry-level examples. This week, we look at games that feature organisation as part of their theme or mechanisms. In this episode we look at a few examples of games that require organisation to play them well. We're getting organised here at the SnakesCast, as we discuss games that feature organisation either as part of their theme or mechanisms. Today, Wednesday April 11th 2018, we discuss some excellent games that require some form of organisation in order to play them well. This week, we look at games that feature organisation as part of their theme or mechanisms. Today, we finish by looking at games that encourage organisation in unusual ways. We're getting organised here at the SnakesCast, as we discuss games that feature organisation either as part of their theme or mechanisms. Today, Friday April 13th 2018, we look at games that encourage you to organise in different or unusual ways - including one that all but disallows it. Curating a Café Game Library, Part 1 - What do our curators do? 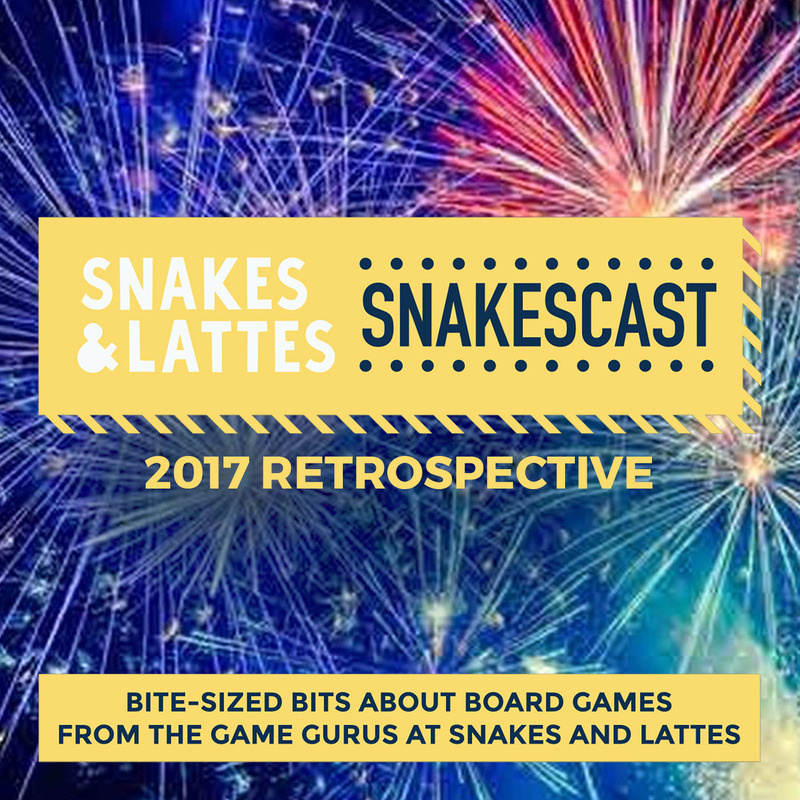 This week, we look inward to one of the things that makes the game libraries at Snakes & Lattes work - curating and maintaining them. We begin by talking about the organisation of the games, and the presentation of the game wall. 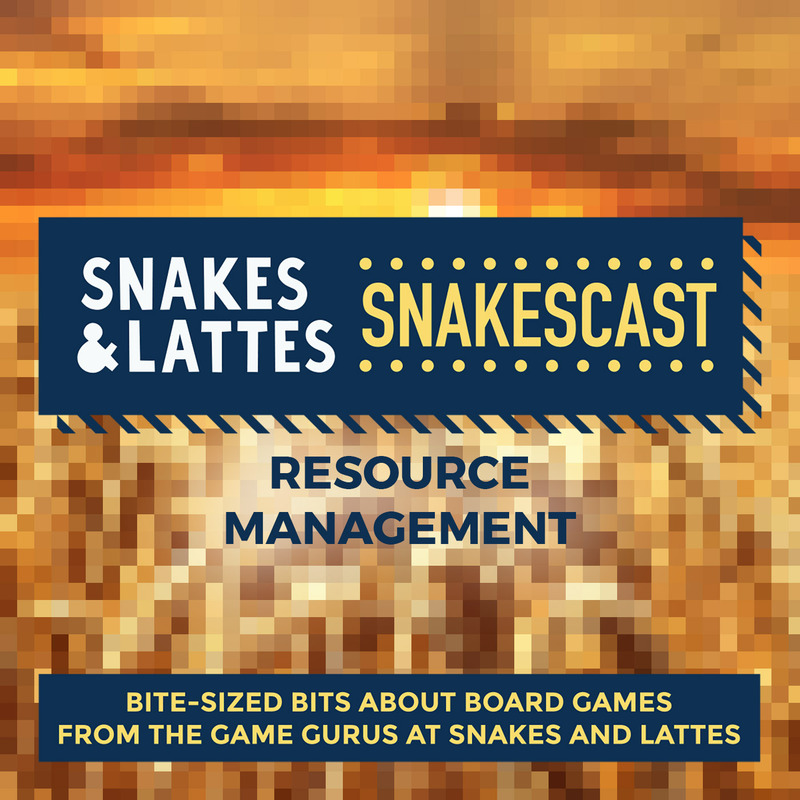 The focus of the SnakesCast turns inward this week, as we examine the process of curating and maintaining our board game libraries. Today, Monday April 2nd 2018, we begin by asking what curation is and the importance of maintaining the visual appearance and accessibility of the game walls. 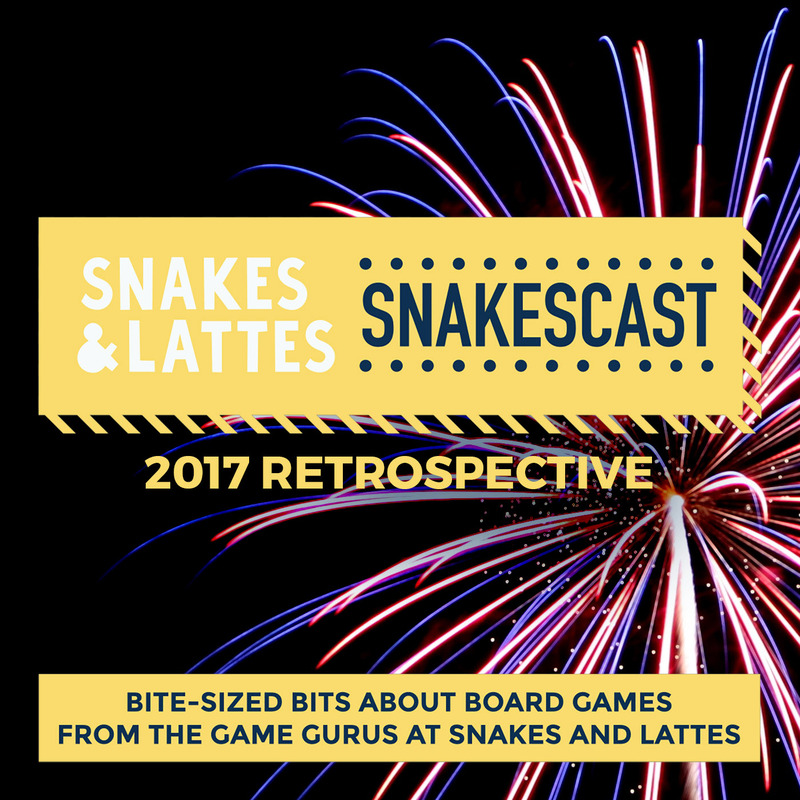 This week, we look inward to one of the things that makes the game libraries at Snakes & Lattes work - curating and maintaining them. Today, the discussion turns to game selection, and how we go about culling or adding games to the library. 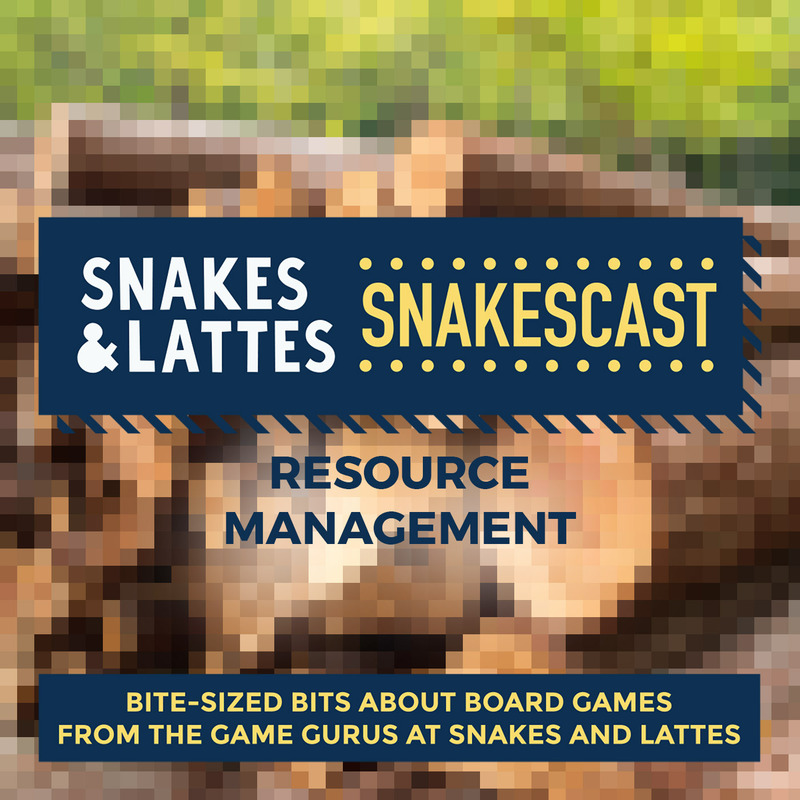 The focus of the SnakesCast turns inward this week, as we examine the process of curating and maintaining our board game libraries. Today, Wednesday April 4th 2018, we turn to the subject of game selection, discussing how we go about both culling games from and adding them to the library. 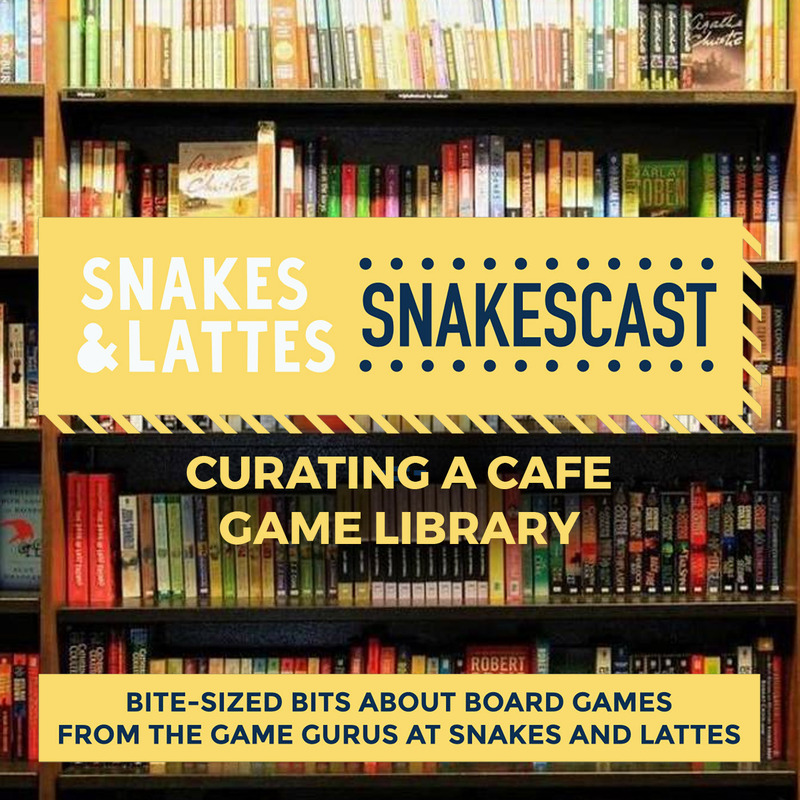 This week, we look inward to one of the things that makes the game libraries at Snakes & Lattes work - curating and maintaining them. We round out the week by talking about preparing games for café life, with a brief tangent on escape room games. 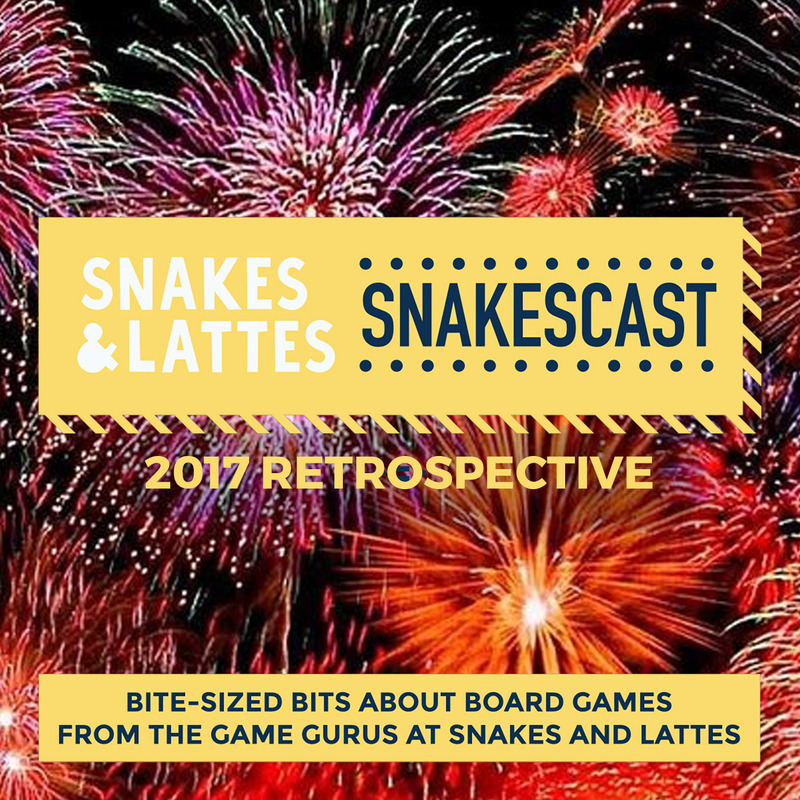 The focus of the SnakesCast turns inward this week, as we examine the process of curating and maintaining our board game libraries. Today, Friday April 6th 2018, we round out the week by discussing how we go about preparing games for life at the café, and go on a brief tangent to discuss the success of escape room games in the Snakes environment. This week, the SnakesCast examines challenges with player interactions at the table, and we discuss ways of solving them that have worked for us. Today, we suggest ways of engaging players who may be distracted during play. This week, the SnakesCast examines challenges that can be faced with player interactions at the table, and we discuss ways of solving them that have worked for us. Today, Monday March 26th 2018, we talk about ways of engaging players who may be distracted while at the table, whether through wandering attention or playing with game pieces. This week, the SnakesCast examines challenges with player interactions at the table, and we discuss ways of solving them that have worked for us. Today, we discuss players who check out during a teach, or those who take forever to take their turn. This week, the SnakesCast examines challenges that can be faced with player interactions at the table, and we discuss ways of solving them that have worked for us. Today, Wednesday March 28th 2018, we look at how to handle players who check out during a teach, including improving your teach to help that, and also players who engage in Analysis Paralysis - taking forever to take their turn while they weigh up every option. This week, the SnakesCast examines challenges with player interactions at the table, and we discuss ways of solving them that have worked for us. We finish by talking about Alpha Players, and also those who take an overly aggressive attitude at the table. This week, the SnakesCast examines challenges that can be faced with player interactions at the table, and we discuss ways of solving them that have worked for us. Today, Friday March 30th 2018, we end up by discussing Alpha Players - those who take over cooperative games and play them for everyone - and players who become overly aggressive at the game table. If you're into managing resources, this is the week for you. 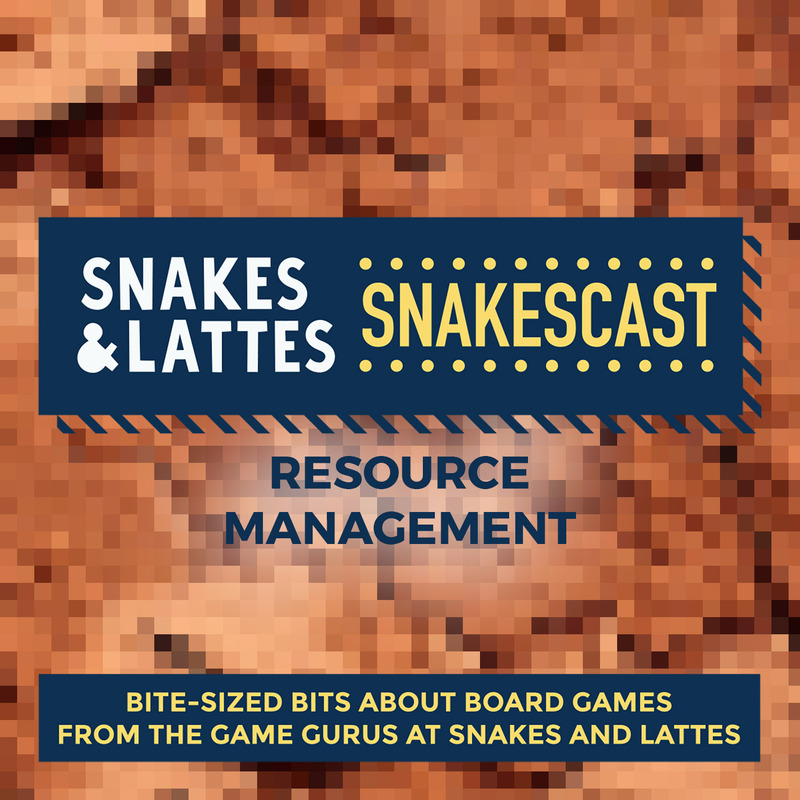 The SnakesCast is looking at games using that mechanism this week, and we end up by looking at three more games which use resource management in very different ways. This week we are making sure we use our resources as efficiently as we can in games featuring the mechanism of resource management. Today, Friday March 23rd 2018, we look at three games that take the mechanism of resource management, but use it in really interesting ways. The Player Contract, Part 1 - What is the player contract? 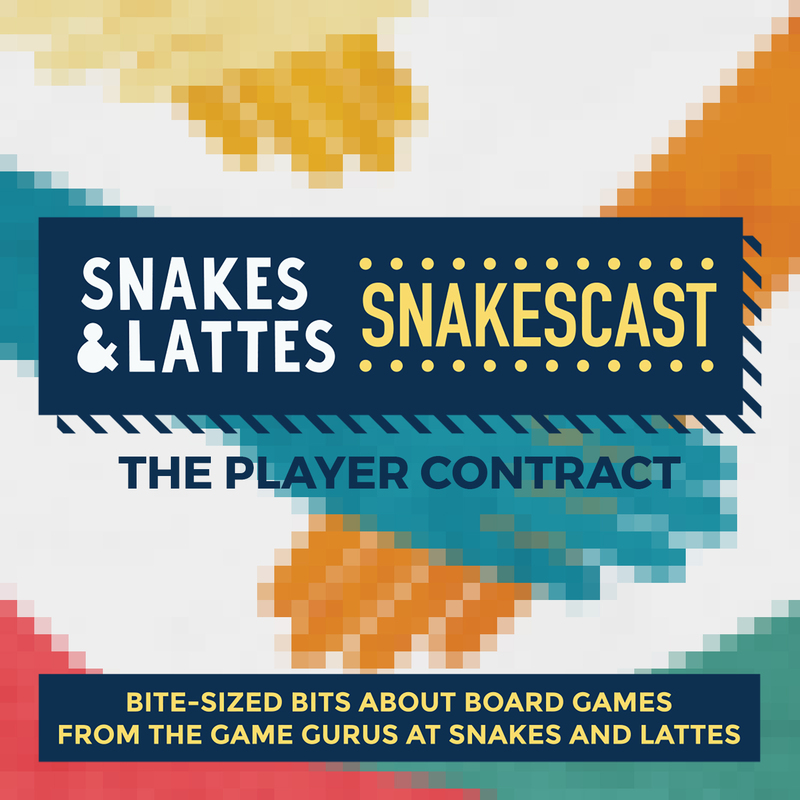 This week, the SnakesCast examines the player contract that is made when a table sits down to play a game. We begin by asking what the player contract is, and how it affects gameplay. This week on the SnakesCast, we sign the metaphorical document known as the Player Contract - the agreement that is made when a group of players sits down to play a game. Today, Monday March 12th 2018, we begin by asking exactly what that contract is, and how it affects the way you approach playing a game. 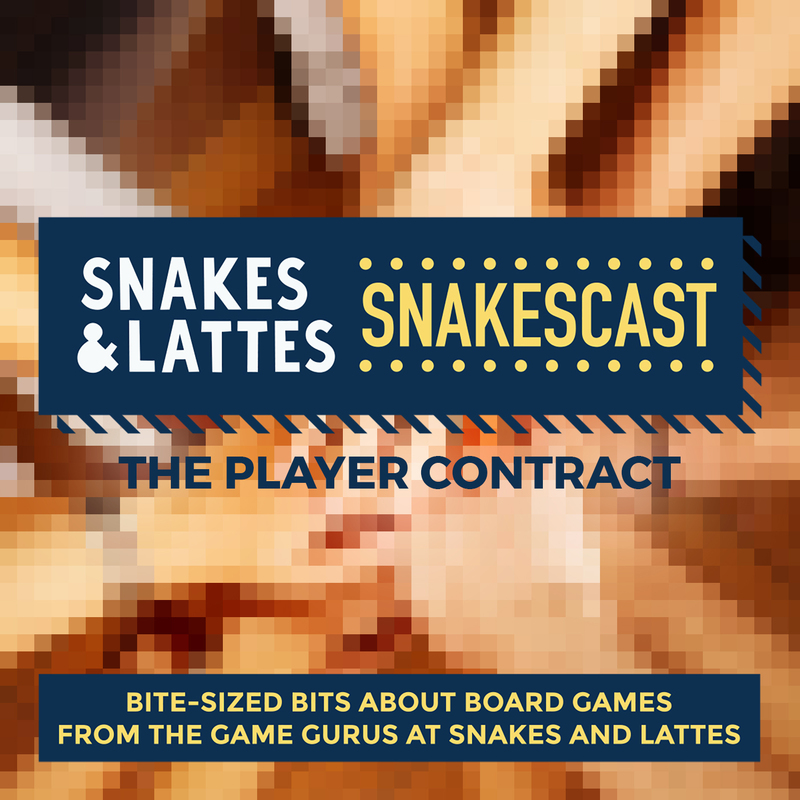 This week, the SnakesCast examines the player contract that is made when a table sits down to play a game. This last episode looks at games where the contract may be very different, and how that relates to the problem of an alpha player. 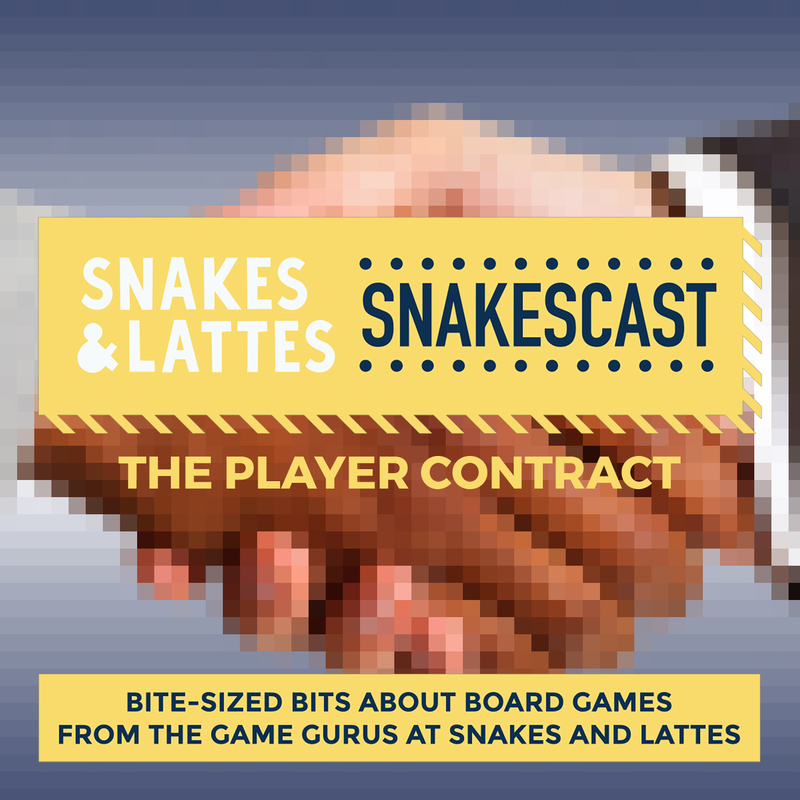 This week on the SnakesCast, we sign the metaphorical document known as the Player Contract - the agreement that is made when a group of players sits down to play a game. Today, Friday March 16th 2018, we look at the fine print for situations where the contract may be completely different - it may even be "don't play your best" - and how that relates to the issue of having an alpha player at the table. The chequered board comes to the fore this week as we discuss games that riff off ideas from Chess. Today, we talk about Chess, and what makes it a game that is good to take ideas from. The chequered board comes to the fore this week as we discuss games that riff off ideas arising from mechanisms or aesthetics used in Chess. Today, Monday March 5th 2018, we give a rough overview of Chess, and talk about what makes it a game that offers lots of ideas that can be taken and used in other games. The chequered board comes to the fore this week as we discuss games that riff off ideas from Chess. Today, we're going to look at some great games that have a couple of mechanisms that they share with Chess. The chequered board comes to the fore this week as we discuss games that riff off ideas arising from mechanisms or aesthetics used in Chess. Today, Wednesday March 7th 2018, we examine some examples of games that take those ideas and run with them really well. The chequered board comes to the fore this week as we discuss games that riff off ideas from Chess. Today, we look at a couple more games that are akin to Chess, and a couple that take the ideas a different way. The chequered board comes to the fore this week as we discuss games that riff off ideas arising from mechanisms or aesthetics used in Chess. Today, Friday March 9th 2018, we look at a couple more games that are akin to Chess in some ways, and a couple that take ideas from Chess, but enact them in a very different game. CORRECTION: The game Tak was actually introduced in the second book in Patrick Rothfuss' series, "The Wise Man's Fear", and not in "The Name of the Wind". We brave the perils of the internet this week, to look at games related to it in a variety of ways. We start by discussing games based on internet culture. 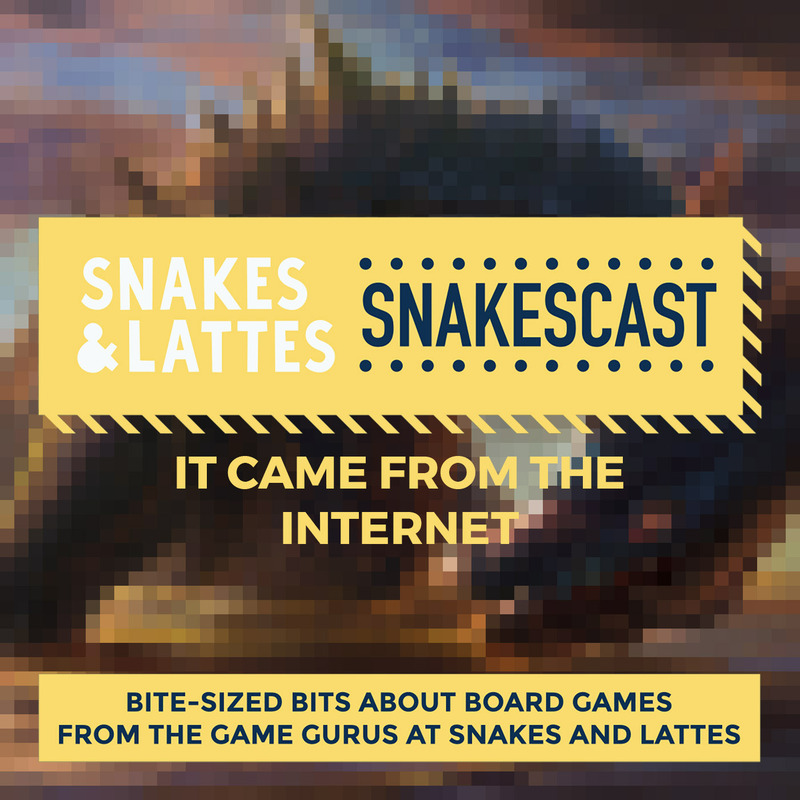 The SnakesCast team ventures into the wild world of the internet this week, to look at games that are related to the internet in a variety of ways. Today, Monday February 19th 2018, we begin by discussing games that are based on topics of internet culture. Games discussed: Concept; #Hashtags; The Game of Things; Damn You, Autocorrect; What Do You Meme? We brave the perils of the internet this week, to look at games related to it in a variety of ways. Today, we talk about games that are based on webcomics and internet properties. 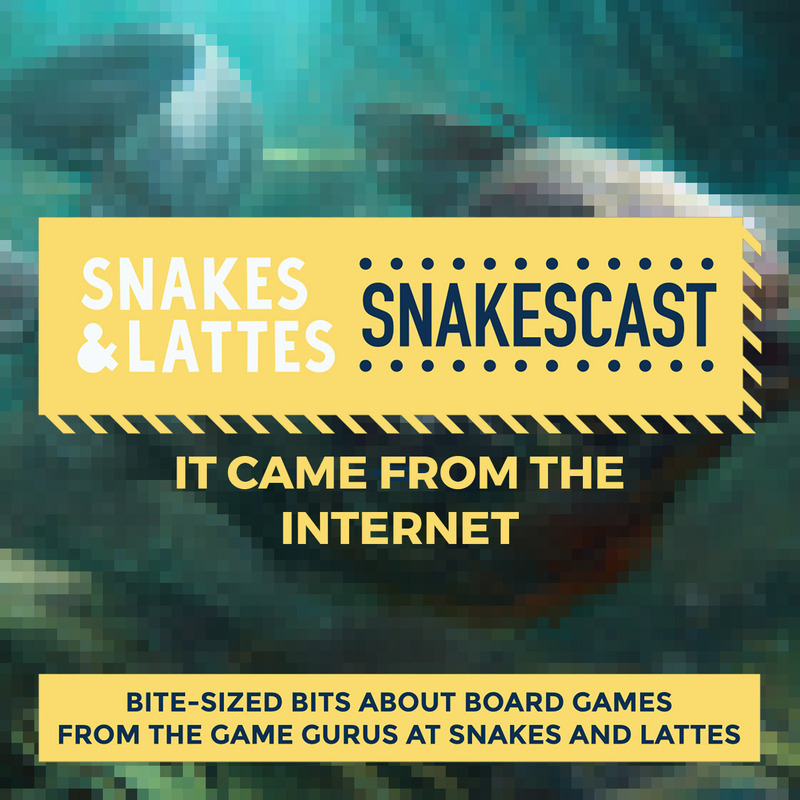 The SnakesCast team ventures into the wild world of the internet this week, to look at games that are related to the internet in a variety of ways. Today, Wednesday February 21th 2018, we look at games that are based on webcomics and other properties that originated on the internet. We brave the perils of the internet this week, to look at games related to it in a variety of ways. We end by discussing games that went viral on the internet, and also how humiliation plays a part in many such games. 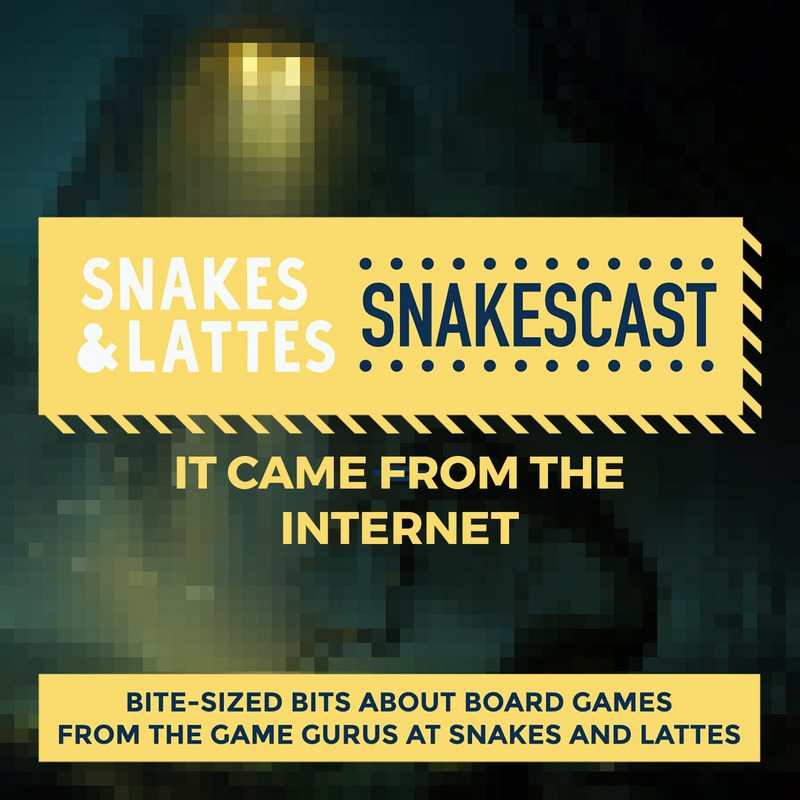 The SnakesCast team ventures into the wild world of the internet this week, to look at games that are related to the internet in a variety of ways. Today, Friday February 23rd 2018, we finish the discussion by looking at games that went viral on the internet, and also examine the ubiquity of humiliation as a component in many games that have found internet popularity. 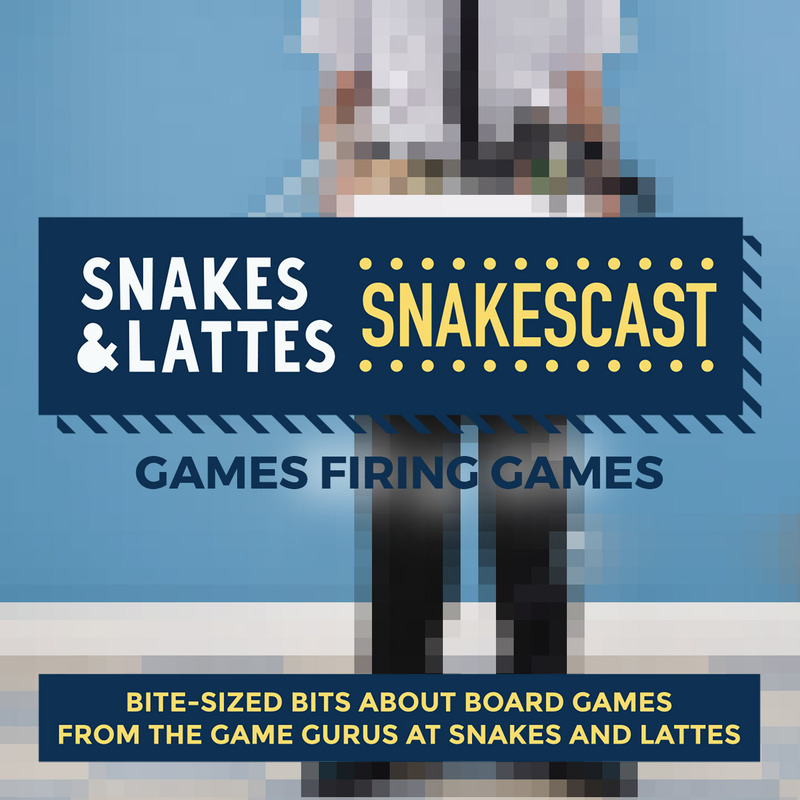 The SnakesCast is looking at games that fired other games by doing what they did, but better. We start by taking a look at some of the popular games that we feel have been improved upon since their release. 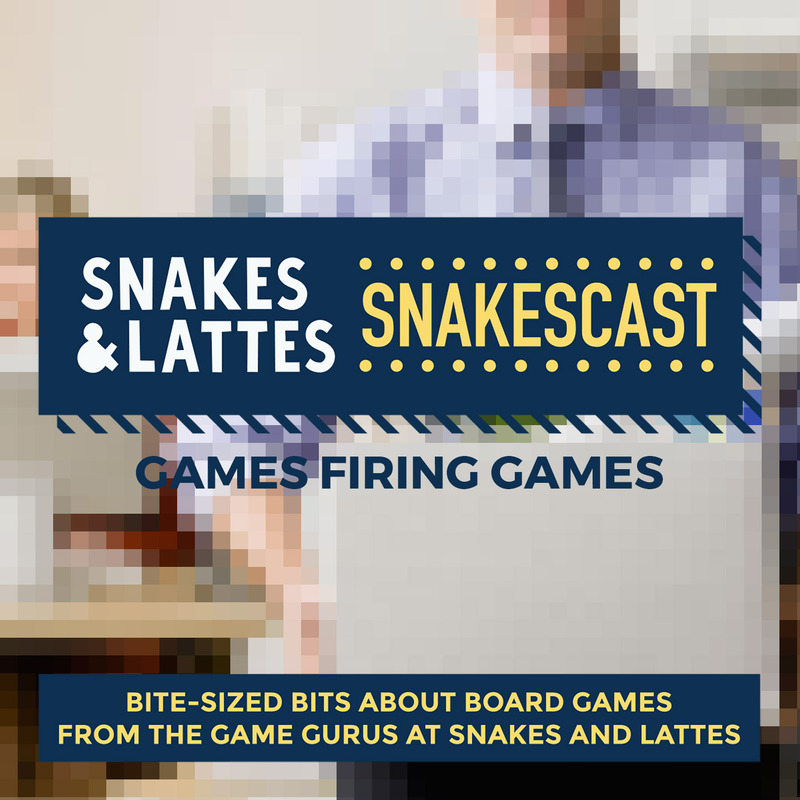 The SnakesCast puts games in the firing line this week, as we discuss games that have been fired by other games - that is to say, something has come along which does what the original game does, but better. Today, Monday February 12th 2018, we begin by looking at some popular titles in board gaming, and the games we feel have dethroned them. The SnakesCast is looking at games that fired other games by doing what they did, but better. In today's episode, we look at the games we would like to fire. The SnakesCast puts games in the firing line this week, as we discuss games that have been fired by other games - that is to say, something has come along which does what the original game does, but better. Today, Wednesday February 14th 2018, we take a look at the games that we would like to fire, and the ones we believe have replaced or could replace them. NOTE: Apologies for the late upload of this episode - our producer would like to fire the ice on the pavement, having fallen foul of it. 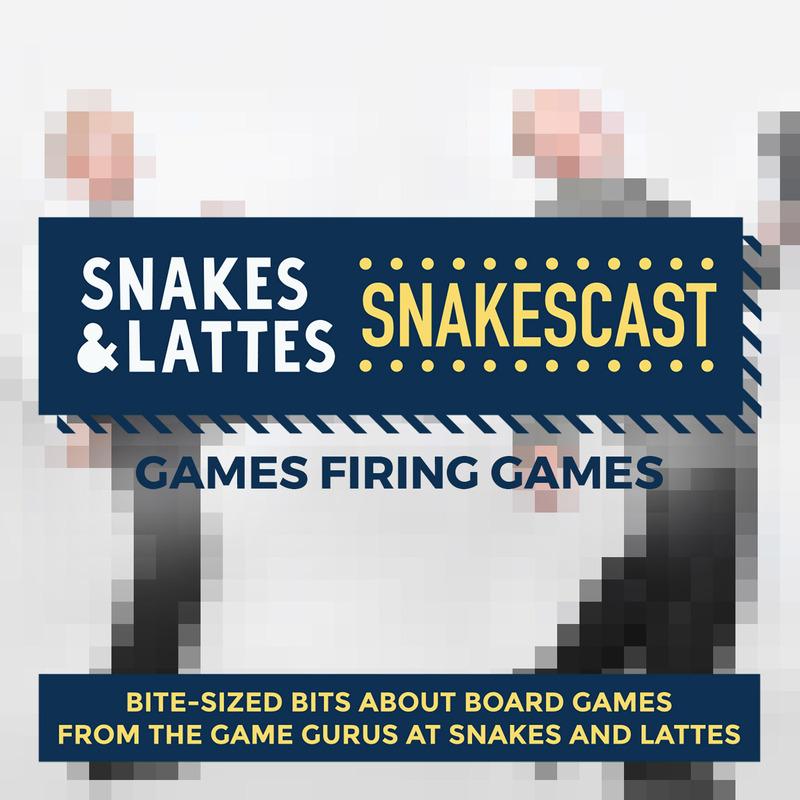 The SnakesCast is looking at games that fired other games by doing what they did, but better. We're finishing up with some heavier games that also could be fired, as well as some other entry-level games, and a discussion of different editions. The SnakesCast puts games in the firing line this week, as we discuss games that have been fired by other games - that is to say, something has come along which does what the original game does, but better. Today, Friday February 16th 2018, we talk about a few more simpler games and then some heavy hitters that could be or have been fired, including how different editions of the same game can fire each other. This week, the SnakesCast looks at games about murder mysteries, and today we are looking at some variations on the theme of Clue, and also discuss why Sherlock Holmes features so heavily. 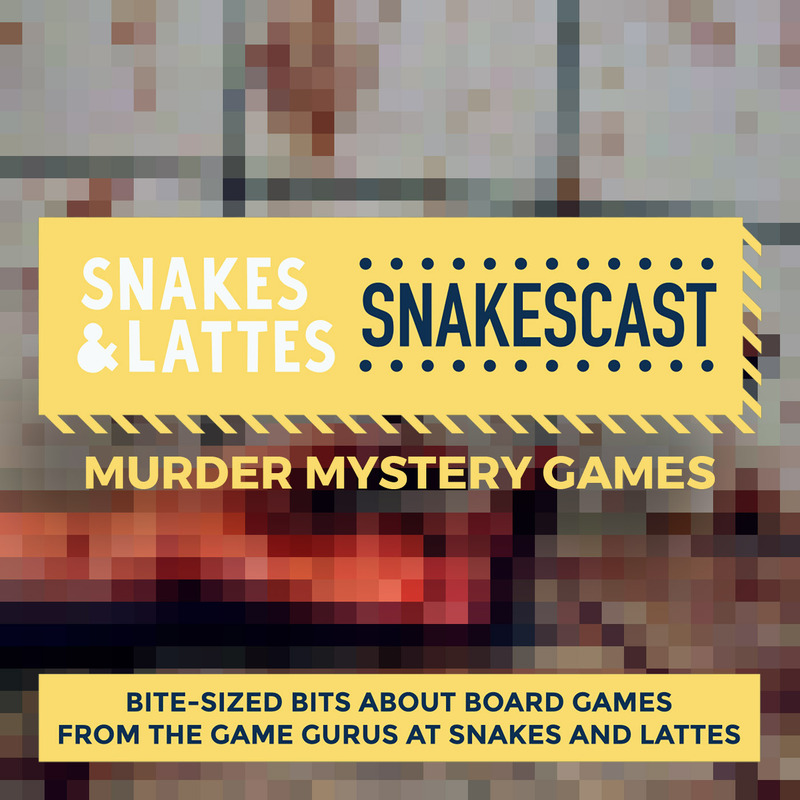 This week, the SnakesCast looks at games featuring detectives, criminals and clues, as we turn our attention to games featuring murder mysteries. Today, Wednesday February 7th 2018, we look at some variations on the Clue theme that add something different to the game, and which will appeal to Clue fans. We also discuss why Sherlock Holmes is so common in games, while other detectives such as Hercule Poirot might not be. 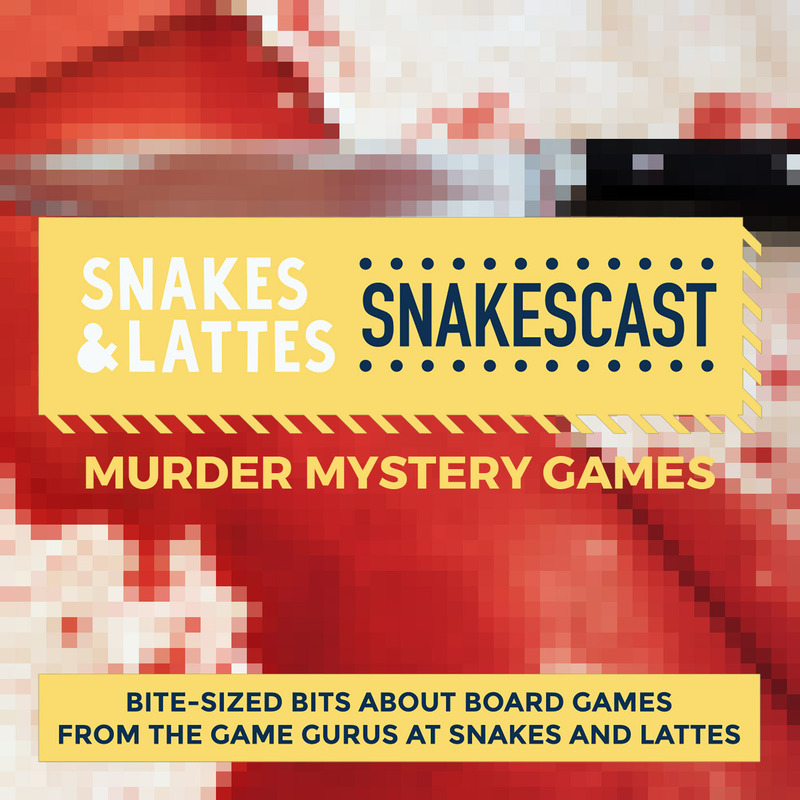 This week, the SnakesCast looks at games about murder mysteries, and we end the week by looking at some of the games inspired by the story of Jack the Ripper. 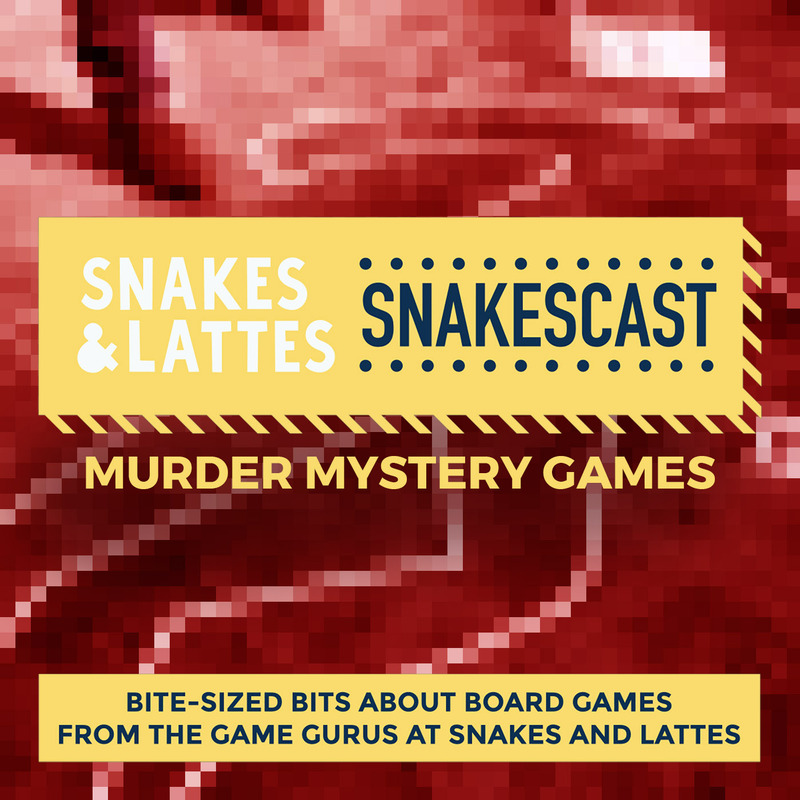 This week, the SnakesCast looks at games featuring detectives, criminals and clues, as we turn our attention to games featuring murder mysteries. Today, Friday February 9th 2018, we finish up this week's discussion by turning to some of the games based upon the story of Jack the Ripper - from the lighter accessible end, to those that dig into the theme and evoked emotion in us as players. As we close out 2017, we look back at the year in board games. Today we start by discussing sequels, consumable games, escape room games, and games set on Mars. Happy Holidays! 2017 is almost over, and as we see the year out, we are going to look back on the year's board game releases. Today, Monday December 25th 2017, we begin by looking at sequels to existing games, escape room games (including a quick tangent on consumable games), and games set on Mars. As we close out 2017, we look back at the year in board games. We look today at the this year's glut of games that are amazing for board game cafés. Happy Holidays! 2017 is almost over, and as we see the year out, we are going to look back on the year's board game releases. Today, Wednesday December 27th 2017, we turn our focus to the games that are our bread and butter - those that are perfect candidates to go on the wall of a board game café. As we close out 2017, we look back at the year in board games. For our final episode of the year, we look at the bigger games that came out this year. Happy Holidays! 2017 is almost over, and as we see the year out, we are going to look back on the year's board game releases. Today, Friday December 29th 2017, we take a look at the bigger games that came out this year, and talk about how some of them caught our eye either by changing things up or being surprisingly familiar. We're taking a week off next week, and will be back after that with new episodes, topics and guests. From all of us here at the SnakesCast, have a very happy New Year, and we'll see you in 2018. Winter has set in, and so we're looking at games about the cold this week. Today we begin by looking at games for kids with accessible designs and some common themes. Winter has set in, and it is cold outside now, so we're discussing games that have something to do with the cold. Today, Monday December 18th 2017, we start by looking at games for kids that have accessible designs, and in the process we spot some common themes amongst them. Winter has set in, and so we're looking at games about the cold this week. We look at the intermediate games today, including original games and re-skins of existing ones. Winter has set in, and it is cold outside now, so we're discussing games that have something to do with the cold. Today, Wednesday December 20th 2017, we continue by looking at intermediate level games, including both original designs and snow-oriented re-skins of existing games. Winter has set in, and so we're looking at games about the cold this week. Today we look at the heavier end of things, and how games have used the theme in ways that either feel cold or just look cold. Winter has set in, and it is cold outside now, so we're discussing games that have something to do with the cold. Today, Friday December 22nd 2017, we look at the heavier games that use the theme. Some of them use it well to make you feel the cold as you play, and others have it more as an aesthetic theme. We also discuss Jonathan's own design process for the Frozen Wastes expansion to Runebound. Apologies for the technical difficulties that delayed the posting of this episode.